A list of the ten Starbucks drinks with the most calories. NEW YORK (TheStreet) -- Last year New York City released an ad campaign called "Pouring on the Pounds" to address obesity. The idea is that many people may not realize how many calories and sugars they drink each day. The campaign was directed at fruit juice drinks, but the logic can carry over to other drinks. Starbucks drinks, for example. It's easy to think about how many calories may be in a fast food burger and fries, but how often do you think about the calories in your Starbucks drink of choice? Some of those drinks can have even more calories than a fast food burger. This list collects the 10 Starbucks drinks with the highest calorie counts. Note that all the drinks in this list are Venti size and use Starbucks’ recommended options. Any modifications, such as a different kind of milk, will change the calorie counts in each drink. The good news for some is that straight Starbucks coffee and tea don’t appear anywhere on this list. The bad news is your favorite drink might make an appearance somewhere in the top ten. 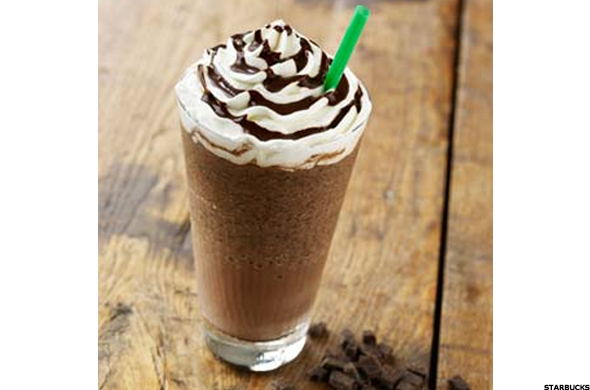 With 500 calories in one 20-ounce cup, the Mocha Frappuccino is tied for the bottom spot on this list. Those 20 ounces also contain 140 mg of caffeine and 79 g of sugar. The drink is one of the simpler ones on the list. 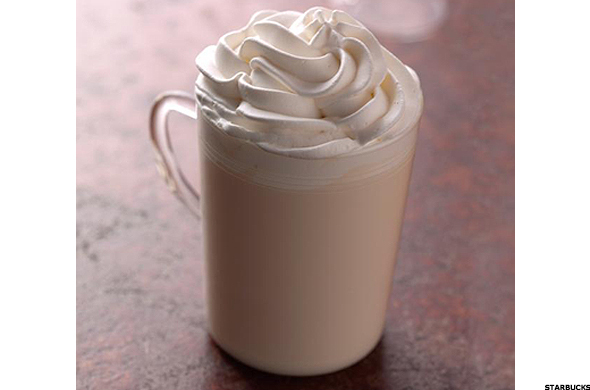 It’s made of coffee with mocha-flavored sauce that’s blended with milk and ice, then topped with whipped cream. A 24-ounce Iced Caffe Vanilla Frappuccino makes the list with a total of 500 calories. The small amount of coffee used to make it gives the Venti drink a modest 120 mg of caffeine. 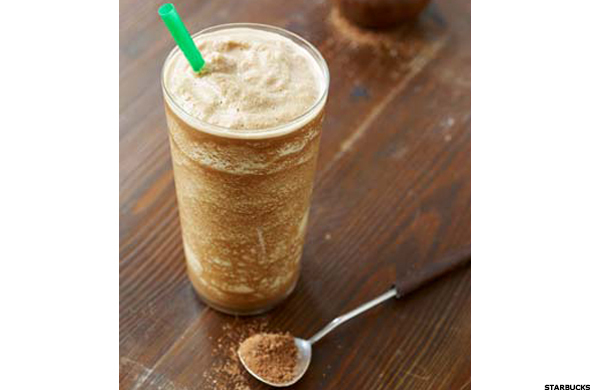 The drink is made with coffee and vanilla bean powder, which are blended with milk and ice like every other Frappuccino. 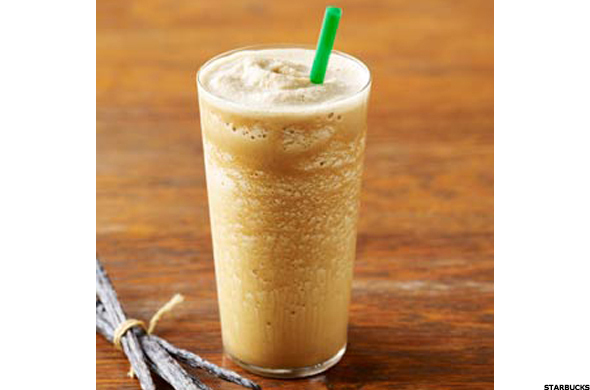 According to Starbucks, the "spicy fragrance" of vanilla enhanced the rich dark-roasted coffee used in the drink. 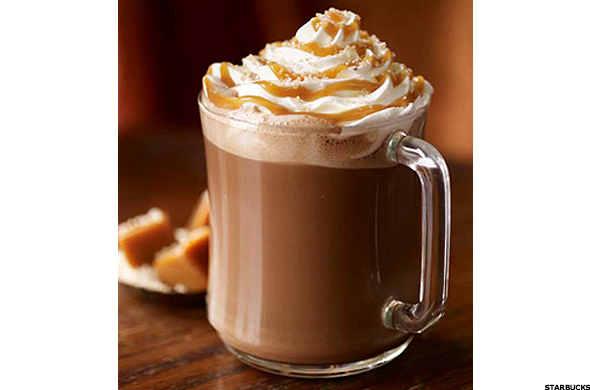 A 20-ounce cup of Salted Caramel Mocha contains 510 calories and about 180 mg of caffeine. Despite its simple name, the drink is one of the more complicated on the list. With 520 calories in a 24-ounce cup the Double Chocolaty Chip Frappuccino Blended Creme is only for those who love the flavor of chocolate. 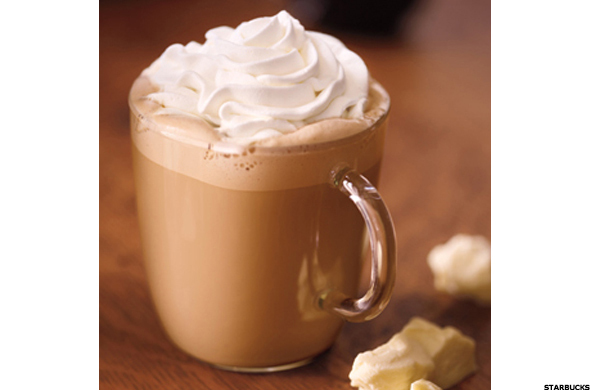 The drink combines "chocolaty" chips, mocha-flavored syrup, milk and ice, topped with whipped cream and mocha drizzle. It must just have too much "chocolate." It is worth noting, however, that the company only uses the terms "chocolaty" and "chocolate-flavored" when describing the drink, or any other "chocolate" drink. There’s no mention of actual chocolate being used to make the drink. The name of the Peppermint Hot Chocolate makes it sound so simple; it's hot chocolate with peppermint flavoring. But sometimes you need to add a few more flavors to make it more interesting. This drink actually contains peppermint-, mocha- and vanilla-flavored syrups mixed with "dark chocolate curls" to make it a bit more complex. 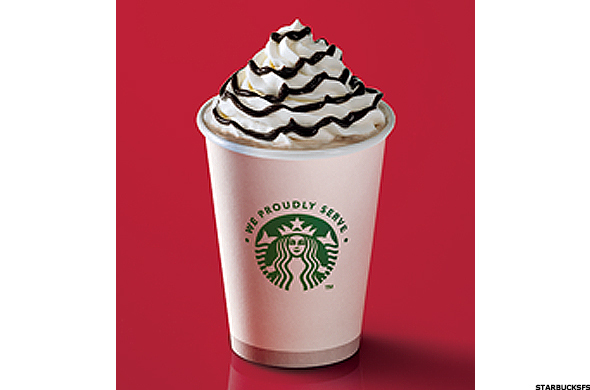 A 20-ounce Venti Peppermint Hot Chocolate contains 550 calories. To put that in perspective, a McDonald's Big Mac also contains 550 calories. The White Chocolate Mocha Creme Frappuccino makes the list with 550 calories in a 20-ounce Venti. The drink also contains 12 g of saturated fat. Starbucks says the drink combines coffee and "white chocolate flavored sauce," that are blended with milk and ice. White chocolate "inspires devotion" according to the company, though it can only offer the flavor of white chocolate in the drink. 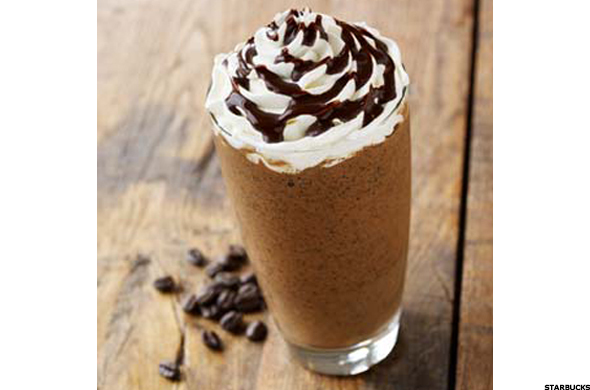 The Java Chip Frappuccino blends the taste of a mocha-flavored sauce, milk and "chocolaty" chips for a 20-ounce drink that contains 580 calories. The drink also contains 95 g of carbohydrates and 21 g of total fat. Starbucks says the drink was made for those who love the taste of chocolate in their iced coffee. The Venti White Chocolate Mocha (distinctly not the White Chocolate Mocha Frappuccino) comes in third on the list with 580 calories in 20 ounces. With 150 mg of caffeine it has far less than even an 8-ounce Clover Brewed Coffee (the coffee has 180 mg), but it’s better than nothing. Starbucks says the drink blends the "elegant, creamy taste" of white chocolate with the "rich, full-bodied" taste of its espresso. 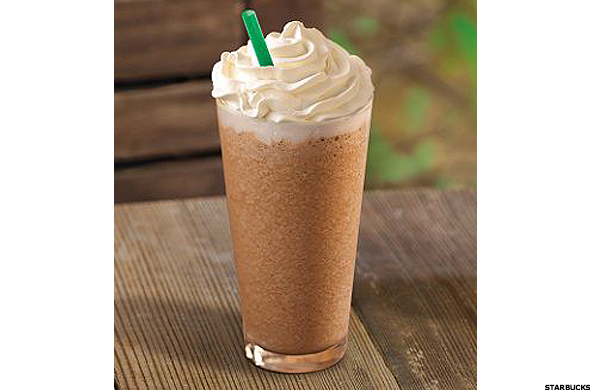 Tied for the top spot on the list is the Venti Mocha Cookie Crumble Frappuccino with 590 calories per serving. The 24-ounce drink also contains about 140 mg of caffeine, which should help keep you awake if you can finish it all. The drink features rich mocha sauce, vanilla syrup, and Frappuccino chips that are blended with Frappuccino roast, milk, and ice and topped with whipped cream and cookie crumbles. The combination sounds great, though the calorie count may make it a bit less enticing. Strangely one of the highest calorie drinks on this list is also one of the most deceptively simple drinks on the Starbucks menu. At 590 calories, a Venti Starbucks White Hot Chocolate has more calories than some meals. The drink also has 15 g of saturated fats, or 75% of the recommended daily value. Starbucks says the drink is "creamier than creamy," with added "buttery white chocolate flavored sauce" to make for a richer taste. Unfortunately, all of that adds up to a drink with more calories than almost every other drink on the menu.